With close to 6 million visitors a year, tourist information is important! 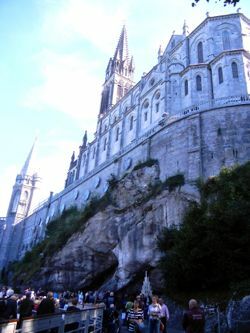 The main Tourist Information Office for Lourdes is not near the sanctuaries. Rather, it is at the Place Peyramale, about one kilometer (.6 mile) away. It's about a 15 minute walk, during which you'll pass lots of hotels, restaurants, and souvenir shops. You might also take a side trip to the château-fort, which is between the Tourist Information Office and the religious center. The Office is just down the street from the Parish Church, where the baptismal font that was used for Bernadette Soubirous is kept. It was Bernadette's visions of the Virgin Mary at the Massabielle Cave in 1858 that changed Lourdes forever. In addition to the official tourist office, there is an Information Center for the sanctuaries near the Basilica of St Pius X that can provide specific information about religious services, processions, and other events at the religious sites. Above, Massabielle Grotto and the Basilicas, Lourdes, France.